Darren Ferguson says Doncaster Rovers cannot afford to be drawn into a battle at Bristol Rovers’ Memorial Stadium fortress. The Pirates sit just two places and three points better off than Rovers going into tomorrow’s League One clash. 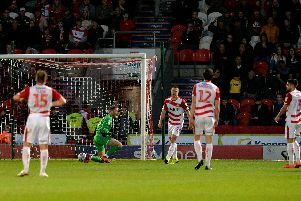 But they boast the fourth best home record in the division with seven wins from 11 games on home soil - a tally bettered only by Wigan Athletic, Shrewsbury Town and Portsmouth. For Rovers, in 18th, just three points above the drop zone, the trip south west is the start of an important trio of games against sides in and around them in the table, including the Boxing Day visit of Northampton Town to the Keepmoat Stadium and a home game with struggling Rochdale. But in order to return to winning ways, following the disappointing defeat at Oxford and draw with Oldham, Ferguson knows exactly what his team will have to cope with against Darrell Clarke’s side - and what they have to avoid. “They got heavily beaten on Saturday [at Gillingham] but in the two previous home games they beat Rotherham and comfortably beat Southend,” said Ferguson. “They’re a big team, physical, they go back to front very quickly so we’ll have to match all that, physicality, set pieces are a real threat. Long throw. We’ll have to manage all that and the pitch, it’s heavy, it’s dead. “The last two home games they’ve done well, they’ve been very aggressive, up and at you and in your face. So that’s the game I’m expecting. “We’ll need to be a lot better on the ball because I don’t want it turning into that sort of game,” he continued. “We need to show a lot of composure on the ball. “We have to still try and play in the right areas because if we keep giving it back to them or it ending up being about second balls, that will suit them. James Coppinger and Craig Alcock are fit and in contention to return, while Matty Blair is 50/50.